TLJ News: March 26-31, 2012. 3/30. The Executive Office of the President's (EOP) Office of the Intellectual Property Enforcement Coordinator (OIPEC) released a report [130 pages in PDF] titled "2011 U S Intellectual Property Enforcement Coordinator Annual Report on Intellectual Property Enforcement". Summary of Report. This report states that it describes the "coordinated efforts that the U S Government is undertaking to address the challenges of enforcing intellectual property of U S rightholders abroad, securing supply chains, pursuing sources of counterfeit and pirated goods, and meeting the challenges posed by emerging criminal trends such as the online sales of counterfeit pharmaceuticals, economic espionage, and targeted theft of trade secrets". This report states that the OIPEC "will work to ensure that law enforcement efforts continue to increase". In states that in 2012 the OIPEC "will encourage the expansion of voluntary best practices for online advertising to cut off revenue to websites distributing counterfeit and pirated goods". In addition, the OIPEC "will continue to assess Federal laws and work with Congress to make certain that Federal agencies have the necessary enforcement tools they need to effectively combat intellectual property theft and we are focused on increasing international cooperation and enhancing capacity building through training, deployment of U S personnel overseas and diplomatic engagement with foreign nations". This report states that the federal government "is leading by example by taking pro-active measures to ensure that the Federal government itself does not purchase and use counterfeit goods". It also states that the OIPEC "continues to encourage improved transparency in intellectual property policy making". 3/30. The Senate confirmed Maureen Ohlhausen to be a Commissioner of the Federal Trade Commission (FTC). See, story titled "Obama Picks Ohlhausen for FTC Commissioner" in TLJ Daily E-Mail Alert No. 2,264, July 20, 2011. The Senate also confirmed Jonathan Leibowitz, who is currently a Commissioner, and the FTC Chairman. This is a reappointment. The confirmation of Ohlhausen comes over eight months after her nomination, and just four days after the FTC issued a major report [112 pages in PDF] on privacy. See, stories titled "FTC Releases Second Report on Privacy Issues", "Reaction to FTC Privacy Report", and "Commentary: Unfair v. Deceptive Conduct" in TLJ Daily E-Mail Alert No. 2,357, March 26, 2012. She briefly worked for the Business Software Alliance (BSA) in 2009. She then worked at the law firm of Wilkinson Barker & Knauer (WBK) as a partner in its privacy, data protection, and cybersecurity practice. Gary Shapiro, head of the Consumer Electronics Association (CEA), praised the confirmation of both Commissioners. He stated in a release that Ohlhausen has a "wealth of knowledge regarding technology issues and an understanding of the need for open dialogue between government and industry". Berin Szoka, head of the Tech Freedom, stated in a release that "this vote should have happened months ago." He added that "It is particularly unfortunate that Ohlhausen's confirmation came just a week after the FTC issued a major report recommending new regulations to protect consumer privacy. Commissioner Rosch, the lone Republican on the Commission since October, issued a scathing dissent, warning that the Report "would install 'Big Brother” as the watchdog over [information collection] not only in the online world but in the offline world." Given the concerns Ohlhausen has expressed about FTC overreach, it seems likely she too would have strongly dissented from the FTC's expansive use of its unfairness authority." Szoka also stated that "Such a voice of restraint has been completely absent on competition, where Commissioner Rosch has joined Chairman Leibowitz in going far beyond traditional antitrust laws to regulate competitive practices they consider ``unfair.´´ Before her nomination, Ohlhausen explained the dangers of this approach." 3/30. There are numerous pending nominations, that require Senate confirmation, that have been approved by the relevant committee, and that are on the Senate's executive calendar. The Senate has just begun a two week recess. Hence, none could be confirmed until Monday, April 16, 2012, at the earliest. There are two pending Federal Communications Commission (FCC) nominations: Ajit Pai to be an FCC Commissioner for a term of five years from July 1, 2011, and Jessica Rosenworcel (at right) to be an FCC Commissioner for a term of five years from July 1, 2010. Pai has been nominated for the seat previously held by Meredith Baker, and Rosenworcel has been nominated for the seat previously held by Michael Copps. See, story titled "Obama Nominates Pai and Rosenworcel to Be FCC Commissioners" in TLJ Daily E-Mail Alert No. 2,309, November 3, 2011. There are three pending nominations for the Board of Governors of the Federal Reserve System: Ben Bernanke, a reappointment as Chairman, Jeremy Stein, and Jerome Powell. Kristine Baker (Eastern District of Arkansas). Gregg Costa (Southern District of Texas). David Campos Guaderrama (Western District of Texas). Gershwin Drain (Eastern District of Michigan). Jeffrey Helmick (Northern District of Ohio). Timothy Hillman (District of Massachusetts). John Lee (Northern District of Illinois). Mary Lewis (District of South Carolina). Robin Rosenbaum (Southern District of Florida). George Russell (District of Maryland). John Tharp (Northern District of Illinois). Brian Wimes (Eastern and Western Districts of Missouri). 3/30 The Senate confirmed Michael Horowitz to be the Department of Justice's (DOJ) Inspector General (IG). He previously worked for the law firm of Cadwalader Wickersham & Taft See, story title "Obama Picks Michael Horowitz to Be DOJ Inspector General" in TLJ Daily E-Mail Alert No. 2,276, August 1, 2011. See also, DOJ release. 3/30. The Senate confirmed Kathryn Keneally to be the Department of Justice's (DOJ) Assistant Attorney General in change of the Tax Division. She previously worked for the law firm of Fulbright & Jaworski. See also, DOJ release. 3/30. The Government Accountability Office (GAO) released a report [75 pages in PDF] titled "Airborne Electronic Attack: Achieving Mission Objectives Depends on Overcoming Acquisition Challenges". This report pertains spectrum based warfare. It addresses the capability of US drones and aircraft to disrupt enemy communications and air defense systems, not the capability of foreign actors to dispute US systems. 3/29. Sen. Kay Hutchison (R-TX), the ranking Republican on the Senate Commerce Committee (SCC), named Richard Russell the Minority Staff Director of the SCC. He has been working for the SCC since November of 2011 as Republican Legislative Director. He will replace Todd Bertoson. Russell worked for the House Science Committee from 1995 through 2001. He then worked in the Executive Office of the President's (EOP) Office of Science and Technology Policy (OSTP) during the Bush administration. He was also U.S. Ambassador to the 2007 World Radiocommunication Conference (WRC) in Geneva, Switzerland. Sen. Hutchison's Senate term ends at the end of the 112th Congress. She is not running for re-election in November. Sen. Jim DeMint (R-SC) is next in seniority among SCC Republicans. See, story titled "Senate Commerce and Judiciary Committees Face Turnover" in TLJ Daily E-Mail Alert No. 2,348, March 7, 2012. 3/29. 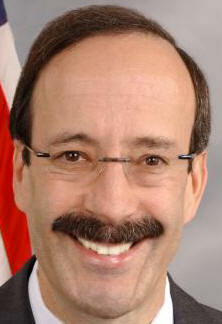 Rep. Eliot Engel (D-NY) introduced HR 4319 [LOC | WW], the "Calling Card Consumer Protection Act". This bill provides that the Federal Communications Commission (FCC) "shall promulgate regulations that require prepaid calling card providers and prepaid calling card distributors to accurately disclose the terms and conditions applicable to prepaid calling cards". This bill states that the Federal Trade Commission (FTC) may also regulate prepaid calling card disclosures. It also provides for enforcement of the FCC's rules by the FCC and by states. It also preempts state statutes that are not identical to the FCC's rules. Rep. Engel (at right) stated in a release that "This bill will put a stop to the deceptive practices of unscrupulous prepaid calling card providers, who have been costing consumers and the industry hundreds of millions of dollars each year". He added that "I learned of these fraudulent practices after hearing numerous complaints from constituents whose cards did not provide the number of minutes advertised. Calling card fraud harms those who are among the most vulnerable; poor, minority, and immigrant populations as well as our military serving overseas". Rep. Engel sponsored a similar bill in the 111th Congress. See, HR 3993 [LOC | WW], the "Calling Card Consumer Protection Act". He also sponsored a similar bill in the 110th Congress. See, HR 3402 [LOC | WW]. Rep. Engel introduced HR 3993 (111th Congress) on November 3, 2009. The HCC's Subcommittee on Commerce, Trade and Consumer Protection held a hearing the next day. The Subcommittee amended and approved the bill on March 24, 2010. The full Committee amended and approved the bill on May 5, 2010. The House passed it on June 23, 2010, by a vote of 381-41. See, Roll Call No. 383. All of the no votes were cast by Republicans. The Senate did not pass that bill. The related bill in the Senate in the 111th Congress was S 562 [LOC | WW], titled the "Prepaid Calling Card Consumer Protection Act of 2009". See also, story titled "House Subcommittee Approves Calling Card Consumer Protection Act" in TLJ Daily E-Mail Alert No. 2,065, March 25, 2010. 3/29. The Fair Labor Association (FLA) released a report on March 29, 2012, regarding conditions at three Foxconn plants located in the People's Republic of China (PRC) that manufacture electronic devices for Apple, including iPad, iPhones, iPods, and computers. The report covers plants in Ghengdu, Longhua, and Guanlan operated by the Hon Hai Precision Industry Co., Ltd., which also known a Foxconn. See, FLA web page with hyperlinks to report and appendices. The report addresses compensation, hours worked, working conditions, safety, communications and relations between Foxconn and its workers, worker satisfaction, and other issues. The body of the report [13 pages in PDF] states that "After growing criticism during 2011 about the working conditions at Foxconn, including those conditions that led to deadly accidents, Apple agreed to allow FLA to conduct a thorough investigation of those suppliers, beginning with three factories at Guanlan, Longhua, and Chengdu in China. Much more than an audit for compliance, this investigation is best described as an in-depth, top-down and bottom-up examination of the entire operation." The report documents the low level of compensation of workers. It recommends compensating workers for such things as time spent at company meetings, and for training. However, the report makes no recommendations, and neither Foxconn nor Apple make any commitments, regarding raising wages. The report documents the long work hours per week. However, it also provides survey evidence that most workers are either happy with the number of hours, or want more. That is, they report that they want to work more to earn more. The report also discloses some business and demographic information about the three Foxconn facilities. The Ghengdu facility employs 38,393 workers and makes iPad components and assembles devices. The Longhua facility employs 66,680 workers and makes iPads and Macs. The Guanlan facility employs 73,004 workers and makes iPhones and iPods. About two thirds of the workers in each plant are men, and the average age at each is just over 23. There is also high turnover. While the focus of the report is on working conditions, worker compensations, safety, and other work related issues, the report also addresses environmental issues. Foxconn also has manufacturing facilities in countries other than the PRC. Also, Amazon, Dell, HP and other companies have contracts with Foxconn. The report states that it is the "largest private employer" in the PRC. Apple's web site contains no release or statement regarding this report. Health and Safety. The report states that "The investigation revealed that a considerable number of workers felt generally insecure regarding their health and safety. The issue of aluminum dust was of particular concern, as this was the cause of an explosion at the Chengdu facility last year." The report and appendices contain numerous specifics regarding health and safety risks, along with recommendations for remediation. However, the report contains no data on deaths, suicides, work related injuries, accidents, or health problems at Foxconn facilities. Communications with Workers. The report states that "Investigators found that workers were largely alienated, in fact or in perception, from factories' safety and health committees and had little confidence in the management of health and safety issues. The assessment also suggests that if workers had more involvement with developing and monitoring health and safety procedures, many of the problems with implementation could be avoided. It also states that "factories' communications are almost entirely top-down." Work Hours. This report discloses that workers work long hours, and that Foxconn violates the law with respect to work hours, but that workers are not complaining about work hours. It states that "During peak production, the average number of hours worked per week at Foxconn factories exceeded both the FLA Code standard and Chinese legal limits. This was true in all three factories. Further, there were periods during which some employees worked more than seven days in a row without the required minimum 24-hour break. The root causes include high labor turnover, which undermines efficiency, and gaps in production and capacity planning." The report finds that all three Foxconn facilities violated both the FLA Code Standard (which is 60 hours per week for the total of regular and overtime) and the Chinese legal limit (which is of 40 hours per week and a maximum of 36 hours overtime per month). The report states that worker survey responses "indicated average weekly working hours of 56 hours, average maximum weekly working hours of 61 hours, and occasional long periods without a rest day". However, the survey responses also indicate that this is not the workers' major concern. It states, "When asked in the survey how they feel about working hours, 48% thought that their working hours were reasonable, and another 33.8% stated that they would like to work more hours and make more money. 17.7% of the respondents felt that they worked too much." Yet, the report also contains some analysis of multiple statistics. "Correlating the views of employees on hours of work and contentment levels from the survey suggeststhat after a certain number of hours, employees are not more content if they work additional hours." Pay. The report discloses that workers are paid on time, but that workers are not paid for all of their work. Moreover, compensation is low, and this is the primary complaint of workers. The report states that "While Foxconn wages are above the Chinese average and the legal minimum, the assessment found that 14 percent of the workers may not receive fair compensation for unscheduled overtime. The assessors discovered that unscheduled overtime was only paid in 30-minute increments. This means, for example, that 29 minutes of overtime work results in no pay ..."
Pay is a major issue with workers. The states that "wages are paid on time and are above the applicable legal rates. The legal minimum wage in Shenzhen is RMB1500, while the starting wage at Foxconn is RMB1800. After the probation period, wages go up to about RMB2200. Sick leave payments are higher than the local law requirement, with workers compensated 70% as opposed to the minimum law requirement of 60%. Overtime hours were also paid at the appropriate premiums." Renminbi, or RMB, is the official currency of the PRC. The primary unit is the Yuan. 1500 Chinese Yuan per month is about $238 per month in US Dollars, or $2,856 per year. In comparison, the price in the US of Apple's latest version of the iPad ranges from $499 to $829. See, Apple iPad sales page. The report states that Foxconn has agreed to deal with "unscheduled overtime and work-related meetings outside of regular working hours" and "workers will be paid for overtime in units of 15 minutes and for work-related meetings outside regular hours will be compensated". However, Foxconn has not agreed to raise salaries. Moreover, the report states only that the "FLA recommends a follow-up study to document spending patterns and the actual costs of the components of a basic needs wage". 3/29. Federal Communications Commission (FCC) hosted a gathering regarding e-books, the e-rate, and related issues. Chairman Julius Genachowski gave a brief speech about the "digital textbook ecosystem". He said nothing about the activities or operations of the FCC, other than to praise the FCC and its e-rate subsidy program for schools. The FCC's e-rate tax and subsidy programs bear a slight resemblance to a program described at 47 U.S.C. § 254. Subsection 254(h) provides for telecommunications carriers to subsidize telecommunications services at elementary and secondary schools, libraries, and health clinics. As implemented by the FCC in 1997 and 1998, subsidies were provided for telephone service, internet access, and internal connections. More recently, the FCC has further expanded in several respects, most notably to subsidize broadband internet access service, and to use e-rate subsidized school facilities to provide internet access to persons not associated with the schools. See, story titled "FCC Expands E-Rate Program to Cover Non-Educational Services" in TLJ Daily E-Mail Alert No. 2,047, February 18, 2010. The FCC also issued a release that states that the FCC has a "pilot program" that "will help the FCC learn how best to support wireless connectivity services for mobile learning devices, like digital textbooks, so that students and patrons can connect with online resources even when they're not in school or at a library". This release also states that there would be "a savings of $250 per student each year if schools move to digital textbooks". See also, FCC's second release that elaborates on cost estimates. The FCC also released a set of colorful presentation slides regarding planning a transition from print on paper books to interactive digital books. It states "Government agencies and others actively working to ensure access and affordability" and "Adoption of Common Core standards". The FCC has not adopted or proposed any rules that would expand the e-rate program to subsidize acquisition of e-book or e-readers, set e-book technology mandates, require rights holders to publish in digital format, or require schools or students to buy e-books. However, there was a bill in the 111th Congress, HR 4619 [LOC | WW], the "E-Rate 2.0 Act of 2010", that would have expanded the e-rate program to include subsidization of e-books and perhaps e-book readers. It was drafted with calculated obfuscation. See, story titled "Rep. Markey Introduces Sweeping E-Rate and E-Books Bill" in TLJ Daily E-Mail Alert No. 2,043, February 12, 2010. That bill was referred to the House Commerce Committee (HCC) and its Subcommittee on Communications, Technology, and the Internet. It received no hearing, no mark up, and little attention. 3/29. The Senate Judiciary Committee (SJC) held an executive business meeting at which it approved the nomination of Richard Taranto to be a Judge of the U.S. Court of Appeals (FedCir) by voice vote. Sen. Mike Lee (R-UT) voted no. 3/29. The Senate Judiciary Committee (SJC) held an executive business meeting at which it held over the nomination William Kayatta to be a Judge of the U.S. Court of Appeals (1stCir). His nomination is again on the agenda for the SJC's next meeting on April 19, 2012. 3/29. The Senate Judiciary Committee (SJC) held an executive business meeting at which it approved the nomination of Gershwin Drain to be a Judge for the U.S. District Court (EDMich) by a vote of 10-8. Opposition to his appointment is based largely upon his opposition to the death penalty, opposition to mandatory minimum sentences in drug cases, and opposition to the right to keep and bear arms. 3/29. The Senate Judiciary Committee (SJC) held an executive business meeting at which it approved the nomination of Robin Rosenbaum to be a Judge of the U.S. District Court (SDFl) by voice vote. 3/29. The Senate Judiciary Committee (SJC) held an executive business meeting at which it held over the nominations of John Fowlkes (USDC/WDTenn), Kevin McNulty (USDC/DNJ), Michael Shipp (USDC/DNJ), and Stephanie Rose (USDC/SDIowa). All are again on the agenda for the SJC's next meeting on April 19, 2012. 3/29. President Obama nominated Patricia Falcone to be Associate Director for National Security and International Affairs in the Executive Office of the President's (EOP) Office of Science and Technology Policy (OSTP). She is currently Assistant Director. Before that, she worked at the Sandia National Laboratories, in Albuquerque, New Mexico. If confirmed by the Senate, she would replace Philip Coyle. See, White House news office release and release. 3/29. EBay announced in a release that David Marcus will become the President of its PayPal Division on April 2, 2012. He will replace Scott Thompson, who went to Yahoo in January. 3/29. Research in Motion (RIM), maker of Blackberry, announced that Jim Rowan (COO) and David Yach (CTO) will leave the company. Jim Balsillie, a Director, and former CEO, will also leave. RIM announced in release its fourth quarter results for the three months and fiscal year ended March 3, 2012. It stated that the "net loss for the fourth quarter of fiscal 2012 was $125 million". Thorsten Heins, who has been CEO since January, remains. 3/29. The New America Foundation (NAF) named James Vasile head of its Open Technology Initiative's Open Internet Tools Project (OITP). See, NAF release. His prior employment includes working for the law firm of Cravath Swaine & Moore. The NAF offers this explanation of the OITP: it is a "collection of open source projects that help build a truly unfettered internet -- private, anonymous and resistant to control. The projects enhance existing infrastructure, working to enable and protect communication, even in the face of active attempts to suppress it." It adds that to be included in the OITP a proposed project "should focus on ... Access to content blocked or censored by ISPs, governments, or others ... Wireless connectivity where physical connections are cut ... Anonymous communications ... Secure or encrypted communications ... " or "Intranet communications or intermodal bridging". 3/29. The Fair Labor Association (FLA) released a report on March 29, 2012, regarding conditions at three Foxconn plants located in the People's Republic of China (PRC) that manufacture electronic devices for Apple, including iPad, iPhones, iPods, and computers. The report addresses compensation, hours worked, working conditions, safety, communications and relations between Foxconn and its workers, worker satisfaction, and other issues. See, FLA web page with hyperlinks to report and appendices, and body of the report [13 pages in PDF]. 3/28. Joaquín Almunia, the European Commission's (EC) lead antitrust official, gave a speech in Copenhagen, Denmark, on March 8, 2012, titled "Competition policy for innovation and growth: Keeping markets open and efficient". He will give a speech in Washington DC on March 30 titled "Competition Policy for the Post Crisis Era". US antitrust regulators Sharis Pozen and Edith Ramirez will also speak at the same event. He stated in his March 8 speech that antitrust agencies should not ease off on enforcement during economic downturns. "I hear some voices recommending that we should go a bit softer on companies in these lean years. But I have a completely different opinion." Almunia (at right) reasoned that "Anti-competitive behaviour imposes a hidden cost on consumers and on the companies that play by the rules and neither can afford this extra cost during a downturn. We must strengthen our vigilance because when a company breaks competition law it undermines the efforts of regulators to build more efficient markets; it saps the energy of our economy and ultimately slows our progress towards the recovery." However, he once again devoted much of his speech to information technology, interoperability, and standard essential patents (SEPs). He addressed this subject in a speech of February 10, 2012. See, story titled "EC's Almunia Addresses Patents and Communications Standards" in TLJ Daily E-Mail Alert No. 2,335, February 13, 2012. He will give a speech in Washington DC at 2:30 PM on Friday, September 30, 2012, at an event in the Great Hall in the Department of Justice's (DOJ) main building. The other speakers at this event will be acting Assistant Attorney General in charge of the DOJ's Antitrust Division Sharis Pozen (at left), FTC Commissioner Edith Ramirez, and John Shenefield (Morgan Lewis). The DOJ is also grappling with the application of competition law to ICT and SEPs. See, stories titled "DOJ Closes Investigations of Transactions Involving Communications Patents" and "EC Approves Google Acquisition of Motorola Mobility" in TLJ Daily E-Mail Alert No. 2,335, February 13, 2012. Almunia stated on March 8 that "When markets are competitive, companies naturally want to improve processes and diversify their goods and services from their competitors. And undoubtedly, markets are most conducive to innovation when they are open and accessible to all. In industries -- such as IT -- where barriers can be erected using patents and technical standards, competition policy limits the establishment of closed gardens and fosters interoperability across products and services." He discussed the EC's investigation of MathWorks. The EC announced in a release on March 1, 2012, that the EC "opened a formal investigation to assess whether The MathWorks Inc., a U.S.-based software company, has distorted competition in the market for the design of commercial control systems by preventing competitors from achieving interoperability with its products". Almunia said that MathWorks' "software products are widely used for designing and simulating control systems that are deployed in many innovative industries such as in cruise control or anti-lock braking systems (ABS) for cars." "Allegedly, the company is refusing to provide competitors with end-user licences. This means that competitors cannot lawfully reverse-engineer MathWorks' software in order to achieve interoperability with its widely used products." He continued that "As in the Microsoft case, the issue of software interoperability is central to this fresh investigation. In Microsoft the Commission found that a dominant company limits innovation to the detriment of consumers if it does not provide interoperability information for its products." "If the investigation shows that MathWorks did refuse to licence, this might -- depending on the other circumstances of the case -- amount to an abuse of a dominant position." He then stated that "Issues of access and interoperability are closely linked to the use -- and abuse -- of patents and intellectual property rights. I have been following with interest the patent wars among mobile-device firms." He said that "both competition authorities and courts should intervene to ensure that standard-essential patents are not used to block competition". He also discussed the EC's investigation of the Korean company Samsung -- another European assertion of authority to regulate technology companies located outside of Europe, and which do most of their business outside of Europe. The EC stated in a release on January 31, 2012, that it has "opened a formal investigation to assess whether Samsung Electronics has abusively, and in contravention of a commitment it gave to the European Telecommunications Standards Institute (ETSI), used certain of its standard essential patent rights to distort competition in European mobile device markets, in breach of EU antitrust rules". Almunia stated that the Samsung investigation concerns whether Samsung "may have misused the standard-essential patents that it holds and failed to honour its commitment to licence them at terms that are fair, reasonable and non-discriminatory." He continued that "Similar issues arise in the recent complaints of Apple and Microsoft against Motorola." See, story titled "Microsoft Complains to EC Regarding Google's Abuse of Standard Essential Patents" in TLJ Daily E-Mail Alert No. 2,344, February 22, 2012. Google announced its plans to acquire Motorola Mobility in August of 2011. See, story titled "Google to Acquire Motorola Mobility" in TLJ Daily E-Mail Alert No. 2,290, August 15, 2011. The DOJ approved the transaction in February. Almunia stated in his March 8 speech that "standardised technology is the basis for the IT industry to function. Different devices can exchange information and work with each other only thanks to commonly agreed standards. To build a smartphone one needs thousands of standard-essential patents. The holders of these patents have considerable market power and can effectively hold-up the entire industry with the threat of banning competitors' products from the market through injunctions for patent infringements." "By threatening to use injunctions, these companies can also make demands that their commercial partners would not accept under normal circumstances. For example, fearing exclusion from the market, companies might be forced to share valuable patented inventions with a competitor or pay excessive royalties which are then passed on to consumers." He continued that "this may distort competition and reduce the incentives of companies to invest in competing technologies. For instance, one of the potential competition issues we investigated in the Google/Motorola merger was whether, post-merger, the threat of injunctions could be used by Google to extract patent cross-licences from competitors on terms they would otherwise not have agreed to. We came to the conclusion that the market situation was not significantly changed by the transaction so the merger was cleared. He also warned that "this merger clearance does not bless all actions by Motorola in the past or all future action by Google with regard to the use of these standard essential patents." He concluded with the statement that "I am determined to use antitrust enforcement whenever necessary to prevent any anti-competitive conduct by holders of standard essential patents in the future." 3/28. The House Homeland Security Committee (HHSC) amended and approved HR 3563 [LOC | WW], the "Integrated Public Alert and Public Warning System Modernization Act of 2011". Rep. Gus Bilirakis (R-FL) introduced this bill on December 6, 2011. The HHSC's Subcommittee on Emergency Preparedness, Response and Communications amended and approved itl on December 8. Rep. Bilirakis offered offered an amendment in the nature of a substitute [14 pages in PDF] at the mark up. Rep. Bilirakis described his bill, and amendment. He said that "The public alert and warning systems have not been modernized in decades and we must ensure that alerts and warnings work reliably, effectively, and efficiently so that we can make information available to the largest number of people possible, while also protecting and ensuring individual privacy". There was no further debate or discussion. The HHSC approved the AINS by voice vote. This is a vaguely worded bill. It adds a new Section 526 to the Homeland Security Act of 2002 that would require the Department of Homeland Security (DHS) to "establish or adapt, as appropriate, common alerting and warning protocols, standards, terminology, and operating procedures for the public alert and warning system Integrated Public Alert Warning System Modernization". It would also provide that the DHS "shall ensure that the system ... incorporates redundant and diverse modes to disseminate homeland security information and other information in warning messages to the public so as to reach the greatest number of individuals". The bill is not clear as to how much authority the DHS would have. This bill would give the Federal Communications Commission (FCC) a merely advisory role. See also, story titled "House Homeland Security Committee to Mark Up IPAWS Bill" in TLJ Daily E-Mail Alert No. 2,357, March 26, 2012. 3/28. The Copyright Office (CO) published a notice in the Federal Register (FR) that announces, describes, and sets the comment deadline for, its latest proposed increases in fees. The CO proposes to raise the registration fee for filing an online claim from $35 to $65, and raise the fee for filing a claim using a paper application from $65 to $100. This notice states that the CO now "receives approximately 87% of new copyright claims electronically through its online filing system". This notice also states that the CO proposes a new fee of $45 for single authors filing an online claim for a single work that is not a work made for hire. The deadline to submit comments is May 14, 2012. See, FR, Vol. 77, No. 60, Wednesday, March 28, 2012, at Pages 18742-18748. See also, stories titled "Copyright Office Raises Fees" in TLJ Daily E-Mail Alert No. 1,383, June 2, 2006, and "Copyright Office Proposes to Raise Registration Fees" in TLJ Daily E-Mail Alert No. 1,843, October 15, 2008. The CO is raising fees steeply, and often. With these latest proposed fee increases, the price of a single paper filing will have risen from $30 to $100 in six years. This eight page notice does not address the extent to which the CO's fees prevent authors from obtaining the protections afforded by registration, disincent authorship and creation of works, and/or encourage copyright infringement. 3/28. The Copyright Office (CO) published a notice in the Federal Register (FR) that announces, describes, recites, and sets the effective date for, its rules changes eliminating the Form CO application for copyright registration. The CO notice states that "The removal of Form CO leaves applicants a choice of filing an application for registration electronically or by using the appropriate printed application form relating to the subject matter of the application. The amendment also removes the references to CON 1 and CON 2 continuation sheets, which were never developed or made available to the public; the regulations instead now refer only to the continuation sheets currently available for applicants filing paper applications and makes other housekeeping amendments relating to applications for copyright registration." The effective date is July 1, 2012. See, FR, Vol. 77, No. 60, Wednesday, March 28, 2012, at Pages 18705-18707. The CO published a notice in the FR proposing to eliminate Form CO last year. See, FR, Vol. 76, No. 190, Friday, September 30, 2011. 3/28. The Public Knowledge (PK) announced that its Board of Directors appointed former FCC Commissioner Michael Copps to this Board. See, PK release. Copps (at right) stated in this release that the "PK has been an effective champion of the public interest across the whole wide gamut of telecommunications and media issues, and I have especially admired its work toward building a news and information infrastructure that informs citizens and deepens the civic dialogue upon which our self-government depends." The other members of the Board are Kathleen Wallman, Kevin Werbach (University of Pennsylvania business school), Leah Belsky, Susan Crawford, Maura Corbett (Glen Echo Group), Brewster Kahle (Internet Archive), Andrew McLaughlin (Tumblr), Michael Petricone (Consumer Electronics Association), and Gigi Sohn (PK President). The PK is a Washington DC based interest group that focuses on copyright issues and government regulation of media, communications and the internet. 3/28. The Senate confirmed Miranda Du to be a Judge of the U.S. District Court (DNev) by a vote of 59-39. All of the no votes were cast by Republicans. See, Roll Call No. 61. 3/28. The Senate confirmed Susie Morgan to be a Judge of the U.S. District Court (EDLa) by a vote of 96-1. See, Roll Call No. 62. 3/28. The National Telecommunications and Information Administration (NTIA) notice in the Federal Register (FR) that requests comments regarding types and depth of testing that the NTIA intends to conduct in Phase II/III of the Spectrum Sharing Innovation Test Bed pilot program to assess whether devices employing Dynamic Spectrum Access techniques can share the frequency spectrum with land mobile radio systems. The deadline to submit comments is April 27, 2012. See, FR, Vol. 77, No. 60, Wednesday, March 28, 2012, at Page 18793. 3/28. The Federal Communications Commission (FCC) released a report [219 pages in PDF] titled "2010 International Telecommunications Data". See also, FCC release. 3/28. The Copyright Office (CO) published a notice in the Federal Register (FR) that contains its final list of stations listed in affidavits sent to the CO in which the owner or licensee of the station attests that the station qualifies as a specialty station in accordance with the Federal Communications Commission's (FCC) definition of specialty station. The CO will use this list "to verify the specialty station status of those stations identified as such by cable systems on their semi-annual statements of account". See, FR, Vol. 77, No. 60, Wednesday, March 28, 2012 at Pages 18869-18871. 3/27. Rep. Mary Mack (R-CA) and Rep. Marsha Blackburn (R-TN) introduced HR 4263 [LOC | WW], the "Strengthening and Enhancing Cybersecurity by Using Research, Education, Information, and Technology Act of 2012" or "SECURE IT Act". This bill would promote collaboration and information sharing between government agencies and the private sector, create new criminal penalties, increase penalties for existing prohibitions, and provide for more government research. Sen. John McCain (R-AZ), Sen. Kay Hutchison (R-TX) and others introduced S 2151 [LOC | WW], also titled the "SECURE IT Act", on March 1, 2012. It is similar, but not identical to, the House version. Rep. Mack issued a release that states that this bill "facilitates information sharing about cyber threats and cyber attacks between the private sector and the federal government. Importantly, the Bono Mack-Blackburn legislation also removes the legal roadblocks for companies that take critically important and necessary steps to protect their networks from cyber assaults. As a deterrent, the legislation also strengthens criminal penalties for hacking into servers as a growing wave of cyber thieves look to steal everything from credit card numbers to secret government documents." Sen. Hutchison stated in a release that "Our bill focuses on giving businesses the tools they need to protect themselves from the looming threat of cyber criminals, and increased requirements for notification of threats to federal agencies". Both bills would amend the Computer Fraud and Abuse Act (CFAA), which is codified at 18 U.S.C. § 1030, to increase penalties for certain violations, and to criminalize trafficking in passwords. Both bills would create a new Section 1030A titled "Aggravated damage to a critical infrastructure computer". Both bills also address the coordination of government information security policy. Both also provide for more government cyber security research. TOS Violations and Lori Drew. Both bills would prevent prosecutors from charging individuals under Section 1030 solely for violating the terms of service (TOS) of an interactive web site. This is also known as the Lori Drew issue. See, story titled "Groups Urge Reform of Section 1030" in TLJ Daily E-Mail Alert No. 2,279, August 4, 2011. These bills would amend Section 1030's definition of "exceeds authorized access". It currently means "to access a computer with authorization and to use such access to obtain or alter information in the computer that the accesser is not entitled so to obtain or alter". Both bills would provide that "exceeds authorized access" means "to access a computer with authorization and to use such access to obtain or alter information in the computer that the accesser is not entitled so to obtain or alter, but does not include access in violation of a contractual obligation or agreement, such as an acceptable use policy or terms of service agreement, with an Internet service provider, Internet Web site, or non-government employer, if such violation constitutes the sole basis for determining that access to a protected computer is unauthorized". See also, stories titled "Lori Drew Pleads Not Guilty in Section 1030 Case" in TLJ Daily E-Mail Alert No. 1,794, June 23, 2008, "Law Professors Argue for Dismissal of MySpace Section 1030 Prosecution" in TLJ Daily E-Mail Alert No. 1,810, August 11, 2008, and "Jury Returns Guilty Verdict in Lori Drew Case" in TLJ Daily E-Mail Alert No. 1,865, December 2, 2008. 3/27. The Department of Commerce's (DOC) National Telecommunications and Information Administration (NTIA) released its long awaited report [155 pages in PDF] titled "An Assessment of the Viability of Accommodating Wireless Broadband in the 1755 - 1850 MHz Band". The report states that compared to the reallocation of the 1710-1755 MHz band, "the 1755-1850 MHz band presents significantly greater challenges". The report also concludes that "spectrum sharing is a vital component of satisfying the growing demand for access to spectrum and that both federal and non-federal users will need to adopt innovative sharing techniques to accommodate this demand". The report pertains to the entire band. However, it also notes that "the wireless industry is initially most interested in the 1755-1780 MHz portion of this band". The Federal Communications Commission's (FCC) March 2010 staff report titled "National Broadband Plan" stated that "Potential synergies exist between the AWS-3 band and spectrum currently allocated to federal use at 1.7 GHz. There are a number of countries that have allocated spectrum in the 1710-1780 MHz band for commercial use and devices already exist in the international market for that spectrum. Consequently, pairing the AWS-3 band with spectrum from the 1755-1780 MHz band has the potential to bring benefits of a global equipment ecosystem to this band." (Footnote omitted.) See, Recommendation 5.8.3. The FCC's 2010 report recommended that the NTIA conduct the just released study, and complete it in 2010. That FCC report also stated that "If there is a strong possibility of reallocating federal spectrum to pair with the AWS-3 band, the FCC, in consultation with NTIA, should immediately commence reallocation proceedings for the combined band. If, at the end of this inquiry, there is not a strong possibility of reallocation of federal spectrum, the FCC should proceed promptly to adopt final rules in 2010 and auction the AWS-3 spectrum on a stand-alone basis in 2011". The band known as AWS-3 is 20 MHz located at 2155-2175 MHz. The FCC designated this block for Advanced Wireless Service (AWS) in 2005. On September 19, 2007, the FCC released a Notice of Proposed Rulemaking (NPRM) [86 pages in PDF] in its proceeding titled "In the Matter of Service Rules for Advanced Wireless Services in the 2155-2175 MHz Band". It is FCC 07-164 in WT Docket No. 07-195. See, story titled "FCC Releases NPRM for Service Rules for 2155-2175 MHz Band" in TLJ Daily E-Mail Alert No. 1,645, September 25, 2007. FCC Chairman Julius Genachowski stated in a March 27 release that "it's time to focus on the 1755-1780 MHz band. This is a real and unique opportunity to free up 25 MHz of high-value spectrum in the near future." He added that "repurposing the entire band would be very expensive, affect important federal uses and commercial broadcast services, and could take a decade or more". Steve Largent, head of the CTIA, stated in a release that "we are happy to learn that NTIA concludes that they will be able to repurpose the 1755 to 1850 MHz bands", and "We look forward to seeing the maximum amount of this spectrum cleared as soon as possible." Largent continued that "the immediate focus should be on the 1755-1780 MHz band, recognizing that limited government operations may remain in the band beyond the near-term. We will be significantly concerned if NTIA's efforts to clear the 1755-1780 portion of the band remain in limbo until relocation of all of the operations in the entire 1755-1850 MHz band can be completed. Moving forward with 1755-1780 MHz, which has a natural AWS 3 pairing identified in the recent spectrum legislation, should be of paramount importance for NTIA and the Administration." Joan Marsh of AT&T stated in a release that this report "is an important step by the Administration. AT&T commends NTIA and Assistant Secretary Larry Strickling for moving aggressively and creatively toward the reallocation of a significant amount of spectrum vitally needed by the wireless industry." AT&T stated in a comment submitted to the FCC on July 8, 2011, that the FCC "should continue to work with NTIA to repurpose the 1755-1780 MHz band and pair it with the AWS-3 band at 2155-2175 MHz and the upper portion of the AWS-2 J Block at 2175-2180 MHz." See also, Verizon Wireless comment, Sprint Nextel comment, and T-Mobile comment of July 8, 2011. Harold Feld of the Public Knowledge (PK) stated in a release on March 27 that "This is a watershed moment because the government recognizes that new approaches are needed to spectrum policy. We can no longer rely on squeezing more spectrum from Federal users to meet our ever-expanding needs for wireless services." Matt Wood of the Free Press stated in a release that "There is a growing consensus that clearing this spectrum entirely and then auctioning it off to incumbent wireless carriers would be a complex and expensive task, and we are glad to see lawmakers, wireless industry players, technology companies and consumer advocates all coming together to make quicker, smarter and better use of this band by sharing it." See also, Telecommunications Industry Association (TIA) release. 3/27. The Federal Communications Commission (FCC) announced in a release that it has retained two auction consulting firms, and one government IT support firm, to assist it in implementing the incentive auction authority provisions of HR 3630 [LOC | WW]. The three firms are Auctionomics, Power Auctions and MicroTech. This act gives the FCC authority to conductive incentive auctions, which provide for the sharing of spectrum auction proceeds with the licensees, such as TV broadcasters, who voluntarily relinquish that spectrum. President Obama signed this act into law on February 22, 2012. The FCC stated that this "team of auction experts is led by" Paul Milgrom of Auctionomics, who is also a professor at Stanford University. The team will also include Jonathan Levin and Ilya Segal, both of Auctionomics and Stanford. The team will also include Lawrence Ausubel of Power Auctions and the University of Maryland. MicroTech is firm based in Vienna, Virginia, that provides information technology support to government agencies. The FCC release states that it "will provide state-of-the-art security, systems development and implementation support directly tied to their cloud computing solutions". FCC Chairman Julius Genachowski stated in this release that "Our implementation of this new Congressional mandate will be guided by the economics, and will seek to maximize the opportunity to unleash investment and innovation, benefit consumers, drive economic growth, and enhance our global competitiveness." "Obama Signs Spectrum Bill into Law" in TLJ Daily E-Mail Alert No. 2,345, February 23, 2012. 3/27. The House Foreign Affairs Committee (HFAC) amended and approved HR 3605 [LOC | WW], the "Global Online Freedom Act of 2011". 3/26. The Wall Street Journal published a story on March 26, 2012, by Thomas Catan titled " Trust Buster Takes Hard Line As E-Book Probe Continues". This WSJ story states that Sharis Pozen, the acting Assistant Attorney General in charge of the Department of Justice's (DOJ) Antitrust Division "says she won't stand by quietly if companies make agreements with rivals on price, signaling a stern stance as the department conducts a high-profile probe into electronic-book publishing". Pozen is scheduled to speak at an event at the DOJ main building on Friday, March 31. 3/26. Kenneth Wainstein joined the Washington DC office of the law firm of Cadwalader Wickersham & Taft. After working as a career federal prosecutor in Washington DC and the Southern District of New York, he held a series of high level technology related positions throughout the Bush administration. First, he was Director of the Executive Office for U.S. Attorneys. He was also General Counsel of the Federal Bureau of Investigation (FBI), Chief of Staff to FBI Director Robert Mueller, and then U.S. Attorney for the District of Columbia. He next served as Assistant Attorney General in charge of the Department of Justice's (DOJ) National Security Division (NSD). Finally, he was Assistant to the President for Homeland Security and Counterterrorism at the end of the Bush administration. Much of his work during the Bush administration related to the Foreign Intelligence Surveillance Act (FISA), the 2001 electronic surveillance act (Title II of the USA PATRIOT Act), subsequent extensions and amendments to that act, and other surveillance matters. He then became a partner in the Washington DC office of the law firm of O'Melveny & Myers (OMM). The OMM web site states that he worked in the firm's "White Collar Defense and Corporate Investigations Practice", and handled Foreign Corrupt Practices Act (FCPA) matters, and other types of cases. A Cadwalader release states that he will work in the firm's "Business Fraud and Complex Litigation Department". Cadwalader's Washington DC office does not have a communications law section. However, it does have an extensive antitrust practice, and its clients include Microsoft. TLJ requested, but did not receive, an interview with Wainstein regarding his electronic surveillance related work experience. 3/26. The House Homeland Security Committee (HHSC) announced that it will meet to mark up several bills, including HR 3563 [LOC | WW], the "Integrated Public Alert and Public Warning System Modernization Act of 2011", on Wednesday, March 28, 2012. See, notice. The HHSC will consider an amendment in the nature of a substitute [14 pages in PDF] offered by Rep. Gus Bilirakis (R-FL), the sponsor of the bill. This bill (as it is to be amended) would add a new Section 526 to the Homeland Security Act of 2002 that would require the Department of Homeland Security (DHS) to "establish or adapt, as appropriate, common alerting and warning protocols, standards, terminology, and operating procedures for the public alert and warning system Integrated Public Alert Warning System Modernization". The bill as introduced would give no role to the Federal Communications Commission (FCC). The amendment would create an advisory committee, and provide that the FCC be one agency with representation on that committee. This amendment also lists or describes other members of this advisory committee. The bill lacks specificity regarding the regulatory authority to be created by the bill. The bill would give the DHS standards setting authority. It is silent regarding authority to compel companies to comply with the standard. The bill does not specify whether or not the DHS would have authority to regulate the design, manufacture, sale, or import of cell phones, smart phones, tablet computers, other devices, or software. There is a similar bill, HR 2904 [LOC | WW], also titled the "Integrated Public Alert and Public Warning System Modernization Act of 2011", that would give the Federal Emergency Management Agency (FEMA) authority to establish standards. The House Transportation Committee (HTC) has oversight jurisdiction with respect to the FEMA. HR 2904 was referred to the HTC. 3/26. A divided Federal Trade Commission (FTC) released a report [112 pages in PDF] titled "Protecting Consumer Privacy in a Era of Rapid Change: Recommendations for Businesses and Policy Makers". The document "recommends that Congress consider baseline privacy legislation", including "data security and data broker legislation". Although, the report is vague as to what should be in "baseline" legislation. It also states that industry should implement a "final privacy framework through individual company initiatives and through strong and enforceable self-regulatory initiatives". Although, the report states that while the FTC will be a part of the process of developing and enforcing this "framework", it is nevertheless "self-regulatory". The report is also vague both as to whether its recommendations for self regulation are also intended as recommendations for the Congress, and whether its recommendations for self regulation will inform its interpretation of the FTC Act for the purpose of bringing future lawsuits and administrative actions. This document also reflects an expansion of FTC reliance upon the word "unfair" in Section 5 of the FTC Act. Heretofore, FTC enforcement actions related to privacy have relied primarily upon the word "deceptive" in the statute. Going forward, the FTC may increasingly regulate privacy related practices under the guise of "unfair" conduct. See, related story in this issue titled "Commentary: Unfair v. Deceptive Conduct". This document does not announce any forthcoming rulemaking proceedings. It does announce several upcoming workshops. However, the FTC may view recommendations or guidance contained in this report as a substitute for either promulgated rules, or a new statutory mandate. FTC Chairman Jonathan Leibowitz asserted in a statement that the FTC is the "nation's privacy protection agency". FTC Commissioner Thomas Rosch, a Republican appointee, wrote a lengthy dissent. The FTC released a document [122 pages in PDF] on December 10, 2010, titled "Protecting Consumer Privacy in an Era of Rapid Change: A Proposed Framework for Businesses and Policymakers". See, story titled "Divided FTC Proposes Do Not Track Regime" in TLJ Daily E-Mail Alert No. 2,169, December 5, 2010. The just released document states that the 2010 document was its "preliminary report", and that the just released document is its "final report". Yet, it states that the FTC will continue to study the issues addressed by this report, hold workshops, solicit comments, and work with businesses and other government agencies. The FTC will likely continue to issue documents that contain legislative recommendations, guidance, and policy announcements. Moreover, many of the items labeled as recommendations in this report are lacking in detail, vague, or tentative, and/or refer to unresolved issues and forthcoming workshops. This document would have been more accurately described as a "second report" or "status report". Legislative Proposals. The report is clear that it recommends Congressional legislation. It is less clear as to what should be in that legislation. The report states, for example, that legislation should address data breaches, but provides no specifics. The report also employs vague language that suggests that some of its recommendations for private sector initiatives may also be construed as legislative recommendations. The report, for example, includes phrases such as, "to the extent Congress enacts any of the Commission's recommendations through legislation". The report also states that the FTC supports "baseline privacy legislation". It then also uses the term "baseline" to refer to its recommendations for private sector initiatives. See for example, page 17. The report states that the FTC "supports targeted legislation" to address "the invisibility of, and consumers' lack of control over, data brokers' collection and use of consumer information" that is "similar to that contained in several of the data security bills introduced in the 112th Congress". The report also recommends passage of data breach legislation. It states that the FTC "has long supported federal laws requiring companies to implement reasonable security measures and to notify consumers in the event of certain security breaches". It also states, "To provide clear standards and appropriate incentives to ensure basic privacy protections across all industry sectors, in addition to reiterating its call for federal data security legislation, the Commission calls on Congress to consider enacting baseline privacy legislation that is technologically neutral and sufficiently flexible to allow companies to continue to innovate." "Rep. Rush Reintroduces Data Accountability and Trust Act", "Rep. Markey and Rep. Barton Release Draft of Do Not Track Kids Act", and "Sen. Rockefeller Announces Forthcoming Do Not Track and Cyber Security Bills" in TLJ Daily E-Mail Alert No. 2,236, May 9, 2011. "Sen. Rockefeller Introduces Bill to Regulate Online Services Providers' Use of Personal Information" in TLJ Daily E-Mail Alert No. 2,237, May 10, 2011. "Rep. Mack Introduces SAFE Data Act" and "House Commerce Committee to Mark Up SAFE Data Act" in TLJ Daily E-Mail Alert No. 2,363, July 19, 2011. "Senate Judiciary Committee to Take Up Data Privacy, Security and Breach Bills" in TLJ Daily E-Mail Alert No. 2,299, September 1, 2011. Recommendations for Private Sector Initiatives. The report contains several recommendations for private sector initiatives. The report addresses do not track. Referring to the Digital Advertising Alliance (DAA) and World Wide Web Consortium (W3C), the report states that the FTC "will work with these groups to complete implementation of an easy-to use, persistent, and effective Do Not Track system". The report addresses data brokers. It states that the FTC "calls on data brokers that compile data for marketing purposes to explore creating a centralized website where data brokers could (1) identify themselves to consumers and describe how they collect and use consumer data and (2) detail the access rights and other choices they provide with respect to the consumer data they maintain." This is in addition to its recommendation for legislation discussed above. The report addresses ISPs and large large platform providers. It states that "To the extent that large platforms, such as Internet Service Providers, operating systems, browsers, and social media, seek to comprehensively track consumers’ online activities, it raises heightened privacy concerns. To further explore privacy and other issues related to this type of comprehensive tracking, FTC staff intends to host a public workshop in the second half of 2012." The report also addresses self regulatory codes. It states that the FTC will participate in developing such codes. It also states that "To the extent that strong privacy codes are developed, the Commission will view adherence to such codes favorably in connection with its law enforcement work. The Commission will also continue to enforce the FTC Act to take action against companies that engage in unfair or deceptive practices, including the failure to abide by self-regulatory programs they join." Data Retention. The report states that "Companies should promote consumer privacy throughout their organizations and at every stage of the development of their products and services." This includes "data security, reasonable collection limits, sound retention practices, and data accuracy". It also states, with respect to data retention, that "companies should implement reasonable restrictions on the retention of data and should dispose of it once the data has outlived the legitimate purpose for which it was collected". The report does not, however, recommend any mandatory time limits on data retention. The report does not discuss pending legislation that would increase data retention requirements, thereby decreasing data security. The House Judiciary Committee (HJC) last year approved such a bill, HR 1981 [LOC | WW], the data retention bill. See stories in TLJ Daily E-Mail Alert No. 2,278, August 3, 2011. Internet Service, Operating Systems, Browsers and Deep Pack Inspection. The report states that "even if a company has a first-party relationship with a consumer in one setting, this does not imply that the company can track the consumer for purposes inconsistent with the context of the interaction across the Internet, without providing choice. This principle applies fully to large platform providers such as ISPs, operating systems, and browsers, who have very broad access to a user’s online activities." "Like ISPs, operating systems and browsers may be in a position to track all, or virtually all, of a consumer’s online activity to create highly detailed profiles". The reports then states that "comprehensive tracking by any such large platform provider may raise serious privacy concerns". It adds that the use by Google and Facebook of "cookies and social widgets to track consumers across unrelated websites may create similar privacy issues", but that the FTC "does not believe that such tracking currently raises the same level of privacy concerns as those entities that can comprehensively track all or virtually of a consumer's online activity". The FTC concludes that "more work should be done to learn" about this, and the FTC will therefore hold a workshop. Enforcement. The report is vague regarding when the FTC has authority, and when the FTC will, initiate administrative adjudication proceedings, or file complaints in the U.S. District Court, against businesses that violate any of this report's recommendations, or any private sector self-regulatory principles. Rep. Joe Barton (R-TX), who is sponsoring privacy legislation, stated in a release that "While the FTC makes good recommendations to businesses, it is important to remember they are not law. These recommendations are not enforceable". On the one hand, the report states that "To the extent the framework goes beyond existing legal requirements, the framework is not intended to serve as a template for law enforcement actions or regulations under laws currently enforced by the FTC." On the other hand, the report also states that the FTC "will also continue to enforce the FTC Act to take action against companies that engage in unfair or deceptive practices, including the failure to abide by self-regulatory programs they join." The report also states that the FTC will "vigorously enforce existing laws". Existing laws include Section 5 of the FTC Act. This report construes the meaning of the FTC Act. Therefore, the question remains, does "vigorously enforce existing laws" include taking action under Section 5 against businesses that act inconsistently with the statements in the report. Rosch Dissent. Commissioner Rosch (at right) listed numerous objections to the report. First, he wrote that the report "is rooted in its insistence that the ``unfair´´ prong, rather than the ``deceptive´´ prong ... should govern information gathering practices", and "take it or leave it". He also questioned the constitutionality of banning "take it or leave it" choice because "that prohibition may chill information collection, and thus impact innovation". He also raised numerous concerns regarding "Do Not Track". For example, he wrote that "it is not clear that all the interested players in the Do Not Track arena ... will be able to come to agreement about what ``Do Not Track´´ even means". He also wrote that "I am concerned that ``opt-in´´ will necessarily be selected as the de facto method of consumer choice for a wide swath of entities that have a first-party relationship with consumers". He also wrote that "I question the Report's apparent mandate that ISPs, with respect to uses of deep packet inspection, be required to use opt-in choice." Finally, he wrote that when the report refers to recommendations and best practices, it also "broadly hints at the prospect of enforcement". 3/26. Sen. John Rockefeller (D-WV), the Chairman of the Senate Commerce Committee (SCC), stated in a release that "This report encourages Congress to pass legislation to promote consumer online privacy protection, and I think that's a recommendation the Committee needs to seriously consider." Sen. Rockefeller (at right) added that "I also agree with the FTC's conclusion that online companies need to do a better job of honoring consumer requests when they make a `do-not-track´ request on their Internet browsers. Those companies said they'd do that, and they need to make good." Rep. Joe Barton (R-TX) stated in a release that "I am pleased to know that the Federal Trade Commission has released a final report regarding consumer privacy. I have been a long time advocate and champion of consumer choice when it comes to personal information being used online. While the FTC makes good recommendations to businesses, it is important to remember they are not law. These recommendations are not enforceable, which is why I loudly echo the FTC's call for privacy legislation. It is not until a law is passed that all companies will truly abide by consumer protection policies." Rep. Barton added that "I believe that it is imperative that my colleagues pay close attention to the advancement of the online world and consider personal privacy a priority. I will continue to stress the importance of consumer protection and work towards privacy reforms." Rep. Ed Markey (D-MA) and Rep. Barton and introduced HR 1895 [LOC | WW],"Do Not Track Kids Act of 2011", last May. See, story titled "Rep. Markey and Rep. Barton Release Draft of Do Not Track Kids Act" in TLJ Daily E-Mail Alert No. 2,236, May 9, 2012. Rep. Markey wrote in a release that "I commend the FTC for this comprehensive and timely set of recommendations, which reflects and reinforces many of the same safeguards contained in the Do Not Track Kids Act." "As in our legislation, the Commission appropriately highlights the importance of providing teens with clear information about how their personal data is used so they can be empowered to exercise control over these uses. The FTC notes that teens are especially vulnerable to targeted advertising due to their use of social media and mobile devices, making it all the more important that legally-enforceable privacy protections for this age group are updated for the 21st century." Jonathan Banks of US Telecom stated in a release that "we support the general principles outlined in the framework for increasing consumer privacy protections." He stated that "all companies should work cooperatively to assure Americans that their personal information is carefully safeguarded. Following on the heels of the Commerce Department’s recent white paper on privacy, today's report takes another positive step toward building a system that provides workable privacy protections for consumers." Leslie Harris, head of the Center for Democracy and Technology (CDT) stated in a release that "Today, the FTC joins the Administration in a growing chorus of support for baseline consumer privacy legislation". The CDT's Justin Brookman stated in this release that "The FTC has delivered an important reminder that Do Not Track standards must address the collection of behavioral data as well as its use ... Moreover, the FTC rightfully refocuses attention on the heightened privacy concerns presented when ISPs, operating systems, and browsers have broad access to consumers’ online activities." 3/26. The Federal Trade Commission (FTC) released a report [112 pages in PDF] titled "Protecting Consumer Privacy in a Era of Rapid Change: Recommendations for Businesses and Policy Makers". This report lacks a discussion of FTC regulation or enforcement based upon either unfair or deceptive conduct. However, the report contains statements that may imply a forthcoming increased reliance upon unfairness, rather than deception, as the basis for FTC interpretation of its statutory authority under Section 5 of the FTC Act. The report attempts to deny this in a solitary footnote buried deep in the report. Footnote number 245 asserts that "This Report is not intended to reflect Commission guidance regarding Section 5's prohibition on unfair methods of competition." Yet, this report, in the least, provides guidance regarding the "unfair" word of Section 5. For example, the just released report concludes that the "``take it or leave it´´ approach is problematic from a privacy perspective, in markets for important services where consumers have few options. For such products or services, businesses should not offer consumers a ``take it or leave it´´ choice when collecting consumers' information in a manner inconsistent with the context of the interaction between the business and the consumer." The FTC report makes no argument that this "take it or leave it" approach is "deceptive" within the meaning of Section 5. It can only be "problematic", therefore, because it is "unfair". It provides as an example, "the provision of broadband Internet access. As consumers shift more aspects of their daily lives to the Internet -- shopping, interacting through social media, accessing news, entertainment, and information, and obtaining government services -- broadband has become a critical service for many American consumers. When consumers have few options for broadband service, the take-it-or-leave-it approach becomes one-sided in favor of the service provider. In these situations, the service provider should not condition the provision of broadband on the customer's agreeing to, for example, allow the service provider to track all of the customer’s online activity for marketing purposes. Consumers' privacy interests ought not to be put at risk in such one-sided transactions." There is no general privacy statute. Rather, most privacy related enforcement actions brought by the FTC rest upon Section 5 of the FTC Act, which is codified at 15 U.S.C. § 45. It is essentially an anti-fraud provision. It provides that "Unfair methods of competition in or affecting commerce, and unfair or deceptive acts or practices in or affecting commerce, are hereby declared unlawful." Although, the FTC has brought a small number of Section 5 actions based upon unfairness. For example, in 2005, in an action against BJ's Wholesale Club, the FTC alleged unfairness in the context of data security. The FTC alleged in its administrative complaint that BJ's "did not employ reasonable and appropriate measures to secure personal information collected at its stores", such as encryption, and that "This practice was an unfair act or practice". See also, FTC web page with hyperlinks to pleadings in that proceeding. Also, criminals engaged in a scheme to obtain the credit and debit card numbers by wardriving and hacking into the wireless computer networks of major retailers, including BJ's. See, story titled "DOJ Announces Cyber Crime Indictments" in TLJ Daily E-Mail Alert No. 1,808, August 7, 2008, and story titled "Hacker Gonzalez Receives 20 Year Sentence" in TLJ Daily E-Mail Alert No. 2,067, March 30, 2010. Also, in 2011, in FTC v. Frostwire, the FTC alleged unfairness in the context of default privacy settings. It filed a complaint in the U.S. District Court (SDFl) that alleged, in Count III, that "FrostWire for Android mobile file-sharing application was likely to cause a significant number of consumers installing and running it to unwittingly share personal files stored on their mobile computing devices with the public", thus increasing "consumers' vulnerability to identity theft", and that this constitutes "unfair acts or practices in violation of Section 5 of the FTC Act". See also, FTC web page with hyperlinks to pleadings in that proceeding. In each of these unfairness based proceedings, the FTC's theory was in the nature of violation of an implied duty to protect consumer data from malicious parties, as a result of negligence, that resulted in financial harm to consumers. In contrast, in the just released report, the FTC's argument that "take it or leave it" is unfair does not rest upon any theory of negligent conduct that results in actual financial harm. The word "deceptive" in Section 5 has meaning in both common and legal usage. It gives persons and businesses some notice as to what actions may subject them to enforcement actions. It provides limits to FTC action. In contrast, the word "unfair" in Section 5 lacks meaning. Whether or not a certain activity is unfair varies from person to person, group to group, business to business, and FTC regulator to FTC regulator. It does not put businesses on notice. It does not limit FTC action. The task of developing a collective determination as to what activities are unfair, and should be subject to prohibition by law, is inherently legislative. In democratic societies, this task is the province of the elected legislature. The FTC, by expanding from reliance upon a theory of deception, to reliance upon a theory of unfairness, is expanding the scope of its activities from enforcement of a legislative prohibition of the Congress, to regulation of conduct unaddressed by the Congress, and assumption of a legislative power. The expertise of the FTC lies in adjudicatory and rulemaking implementation of Congressionally enacted prohibitions, not in conceiving collective societal judgments. Perhaps it should be noted that the FTC has a smaller number of employees, and a smaller budget, when compared to some other federal commissions, as well as the Magnusson Moss Act limitations on FTC rulemaking authority, because in the 1970s the FTC usurped authority to make judgments that were both of a legislative nature, and which the actual legislature would not have made. 3/26. Rep. Darrell Issa (R-CA) and Rep. Elijah Cummings (D-MD) introduced HR 4257 [LOC | WW], the "Federal Information Security Amendments Act of 2012". See, Rep. Issa's release. 3/26. The Executive Office of the President (EOP) released a document that states that the Obama administration "opposes House passage of H.R. 3309". 3/26. The Government Accountability Office (GAO) released a report [48 pages in PDF] titled "Export Controls: Proposed Reforms Create Opportunities to Address Enforcement Challenges". 3/26. Peggy Focarino, the Commissioner for Patents at the U.S. Patent and Trademark Office (USPTO), wrote a short piece titled "Realignment in the Office of the Commissioner for Patents Helps to Improve Efficiency". 3/26. Hewlett Packard (HP) issued a release regarding its ongoing lawsuit against Oracle regarding Intel's Itanium platform. HP stated that it filed "two motions for summary adjudication and summary judgment". It also stated that "The information brought to light during the discovery period further underscores the key facts of this case. In fact, it has led HP to seek a pretrial ruling that Oracle is contractually obligated to offer future versions of Oracle’s software on Itanium. It is time for Oracle to quit pursuing baseless accusations and honor its commitments to HP and to our shared customers." This case is HP v. Oracle, Superior Court of the State of California for the County of Santa Clara, No. 1-11-CV-203163. 3/26. The U.S. Court of Appeals (4thCir) issued its opinion in T-Mobile v. Newport News, a case regarding denial of permission to build a wireless communication tower. T-Mobile filed a complaint in the U.S. District Court (EDVa) alleging violation of 47 U.S.C. § 332(c)(7)(B). The District Court granted judgment to T-Mobile. The Court of Appeals affirmed. This case is T-Mobile Northeast LLC v. City Council of Newport News, et al., U.S. Court of Appeals for the 4th Circuit, App. Ct. No. 11-1293, an appeal from the U.S. District Court for the Eastern District of Virginia, D.C. No. 4:10-cv-00082-RBS-TEM. Go to News from March 21-25, 2012.